Despite my love of film, you can see throughout the many reviews on this site the kinds of films I gravitate towards: big budget sci-fi and fantasy. I rarely head out to see any of the Oscar nominees. 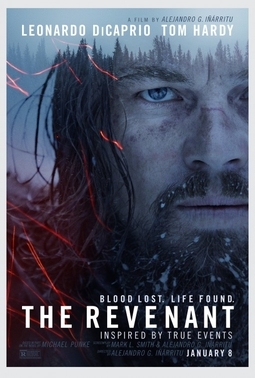 So, when my parents invited me along with them to go see The Revenant I was like, “Sure! Why not?” I’d already heard about The Revenant and how it’s DiCaprio’s latest shot at an Oscar and how it could only film for 2 hours per day because the director chose only to use natural light, so let’s go see an Oscar nominee for once! Based on a true story of the fur trade in the 1820s. Hugh Glass was part of a trapping party, and as they were about to head back to the fort with their latest bounty of pelts, they’re attacked by Native Americans. Glass suggests the best way to get back to the fort is to ditch their boat and their pelts and make the journey over land. The captain agrees, much to the chagrin of Fitzgerald. When he wanders off to do a little hunting for food, Glass is mauled by a bear and near death. The captain decides to leave Glass behind with a few volunteers to nurse him back to health — including Fitzgerald and Glass’s son Hawk. Not really wanting any of this, Fitzgerald attempts to murder Glass, kills Hawk when Hawk tries to stop him, and leaves Glass for dead. The majority of the film then concerns Glass literally crawling out of the wilderness and back to civilization to get his vengeance on Fitzgerald. Filmed largely in southern Alberta, the film is gorgeous, and the mountain peaks are maddeningly familiar as I spent a lot of the film trying to place them. Performances are great all around, especially DiCaprio, who carries the entire film for long stretches. Those long stretches are long. The film did seem to drag on a bit. A powerful story about survival in extreme circumstances, but it could have been a little shorter. Starring Ryan Reynolds, Morena Baccarin, Ed Skrein, T.J. Miller, Gina Carano, Brianna Hildebrand, Stefan Kapicic, and Leslie Uggams. 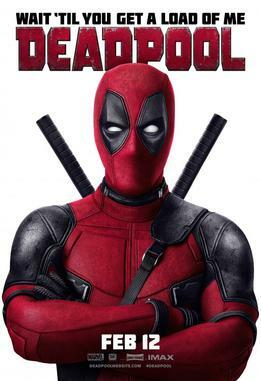 In recent years, Deadpool has become one of the more popular characters in the Marvel pantheon. Maybe it has to do with how superheroes are starting to dominate pop culture, and a lot of Deadpool’s appeal is breaking the fourth wall and mocking everything going on. Anyway, after a brief — and botched — appearance in X-Men Origins: Wolverine, the project fell silent, until some leaked test footage a few years ago got overwhelmingly positive reviews. And now, Deadpool is in your local cinema. Wade Wilson, former special forces operative, but grew a conscience and now works as a mercenary, shaking down thugs. He meets the love of his life, Vanessa, and things are going good…until the inoperable cancer hits. Soon, he’s recruited by a shadowy organization in an attempt to give him superpowers that could cure his cancer. Since the super-soldier process involves months of torture and ultimately leaves Wilson horribly scarred, when his superpowers do kick in, he breaks out and swears vengeance. Taking the name Deadpool, he begins slaughtering those in charge of the program. With two X-Men in tow, Deadpool is soon on track for a confrontation with the villainous Ajax, the man behind the program. Will Deadpool win the day? The film is just incredibly funny. Deadpool’s constant wisecracks and comments on the situation just completely set this above the rest. And then you get Colossus from X-Men, playing the part of the stereotypical “boy scout” superhero, and they make for an interesting dynamic. The action sequences are good. And the end product is highly entertaining. Still doesn’t change the fact that it’s a pretty routine, by-the-numbers superhero plot. An incredibly entertaining superhero outing, thanks to a very entertaining lead. Well, now that I’m back, the real challenge begins: can I keep things going for an entire series…a minimum of 13 episodes? I’ll do my best, darn it! I almost feel like I have to apologize for those who might be tuning this week after last week’s round table special. We’re back to normal now. Just me…rambling about the topics I like. And what are the topics in Episode 9.02: A Windy Day? More Star Wars rambling of course! Talking about the new action figures that are out there! The rise of the Cinematic Universe…even Hasbro is getting in on the act! A bid farewell to 1980s nostalgia, and begin welcoming 1990s nostalgia! So give Episode 9.02: A Windy Day a listen!